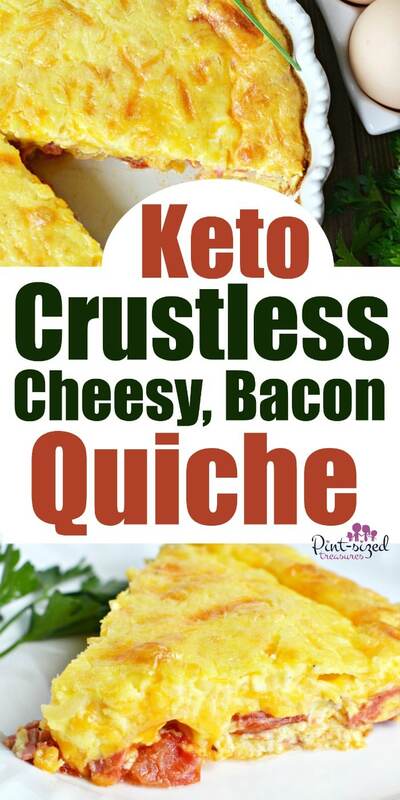 Need a super-quick Keto breakfast that’s crazy yummy? 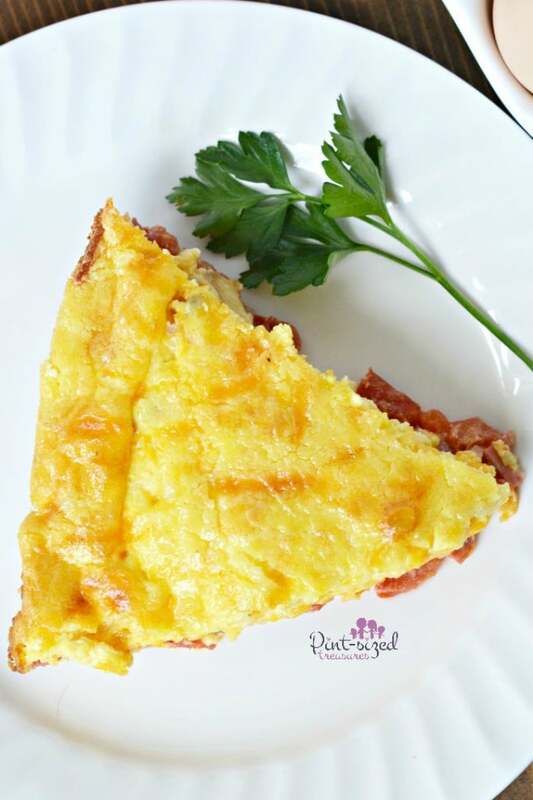 Crustless, cheesy bacon and tomato quiche is exactly what you’re looking for! Powerfully yummy but super simple to whip up! You remember the song on the popular egg commercial, “I love eggs, from my head down to my legs”? 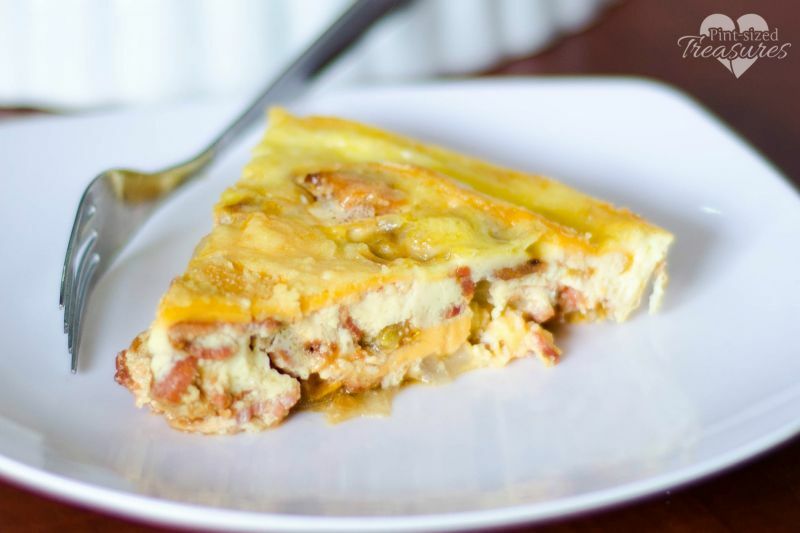 Unfortunately, my daughters have inherited my disgust towards eggs — but then a new egg dish came into our family’s recipe list — cheesy, bacon quiche. That dish has changed my and my daughter’s view on eggs completely. I mean, if I HAVE to eat eggs in an omelette or scrambled with some homemade grits, yes I can get them down. But grits are not on the Keto diet! However, they do pair perfectly with scrambled eggs — just sayin’! On a daily basis, I am not the biggest fan of eggs. I’m more of a protein shake or avocado toast kind of girl. However, it’s very hard for any cheese-lovin’ American to turn away a dish of pie-shaped quiche on their plate — including me! 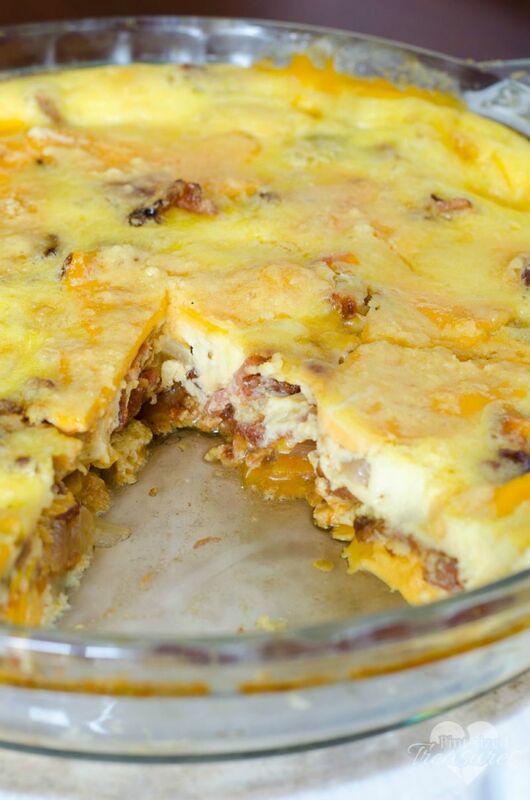 I mean, its oozing with cheese and has lots of tiny pieces of bacon all chopped up and spread throughout the dish. Well, it’s pretty much the best food on earth. With our hectic schedule, our family has been living on toast and cereal for breakfast. But we all wanted a change. I intend to make this keto-friendly quiche every month, but I always forget to pick up some whipping cream. It’s just not the same with plain old milk — you HAVE to have whipping cream! Quiche will never turn out right with any other type of milk. Use whipping cream every time. That’s seriously probably one of the best cooking tips I could give you! A few weeks ago I finally made the keto crustless quiche again, and of course snapped some pics! Recipes like this are meant to be shared and photographed! My kids could hardly wait to dig in. My poor husband was busy with life and failed to notice that a crustless, cheesy quiche was ready to eat. But my quiche-loving kids seized the moment and gobbled it down. They did remember to leave one tiny sliver for their dad…ha! Here’s the low-down, honest truth. 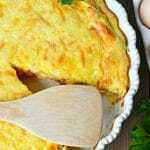 When I wanted to make quiche, I was too tired and too hot to make a pie crust. 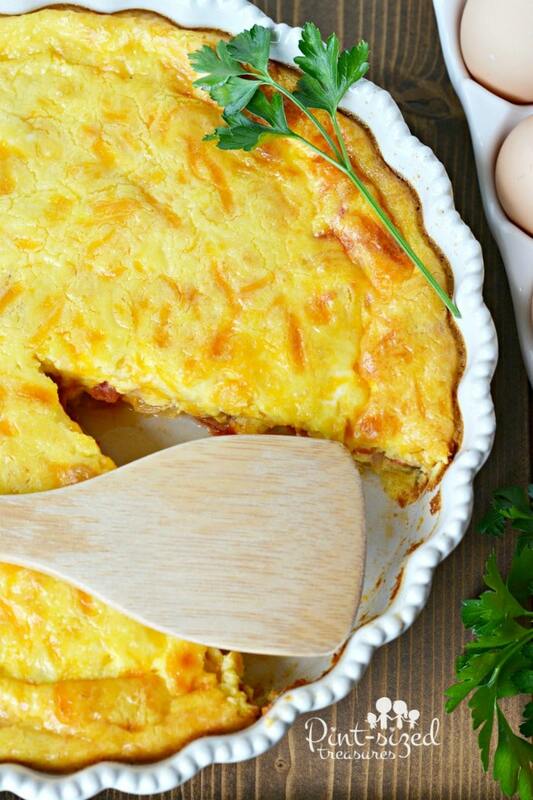 But if you love a classic bacon quiche with a pie crust, this recipe looks sooooo good! And these tiny ham and havarti quiches are too cute to miss! 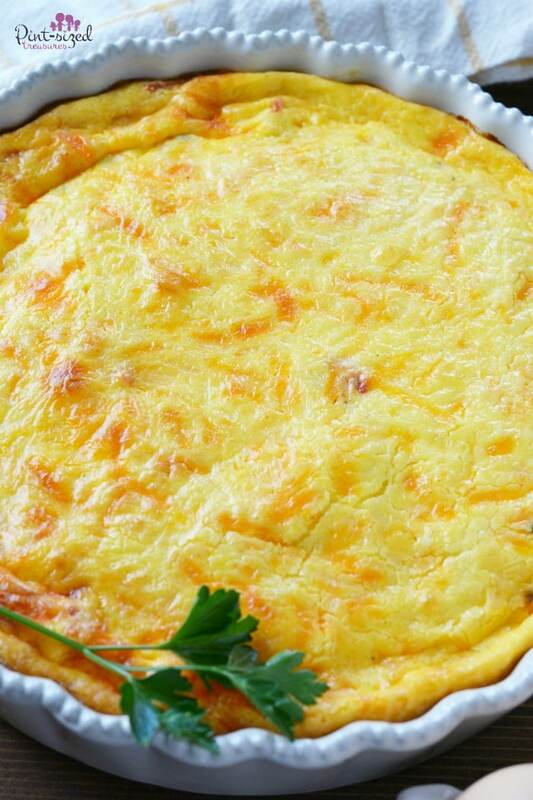 You could definitely make the ini quiches crustless too! I’m still a crustless quiche girl, though. The thought of cleaning up a flour mess some days is simply nauseating to me. I want good food, but a clean kitchen! And a crustless quiche gives me the best of both worlds. If you want a crust, you can just buy a pre-made one from the store and follow the recipe as usual. But, a very good reason that sounds good, is I need to be on a low-carb diet for health reasons. But, that is simply not true. I made it crustless because I did not want to make a pie crust. But, hey! 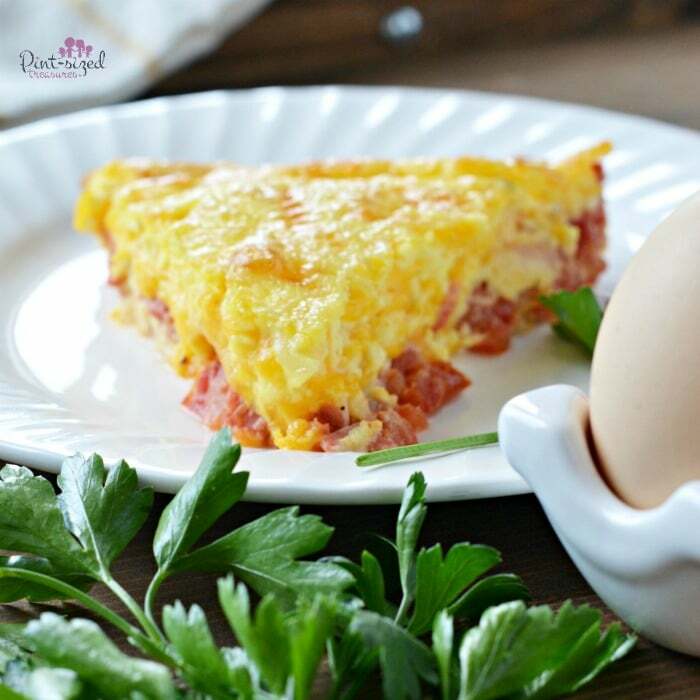 If you are trying to stick to a low-carb or Keto diet, and need a yummy breakfast dish — this recipe is perfect! It is sooooooo easy, and no one seems to remember there is suppose to be a crust. 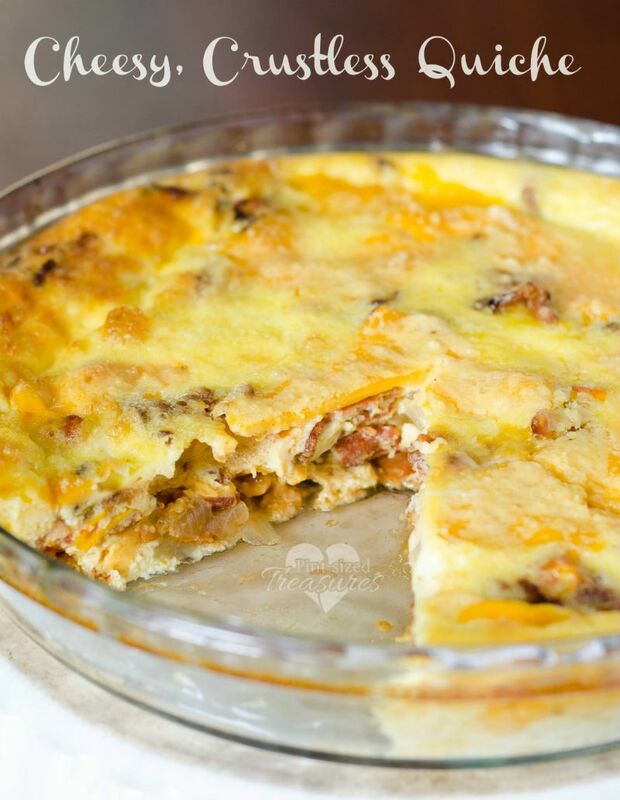 If your family loves a cheesy start to their day, they’ll love this dish! Oh, and we even eat quiche for dinner! Breakfast for dinner is a favorite for me! 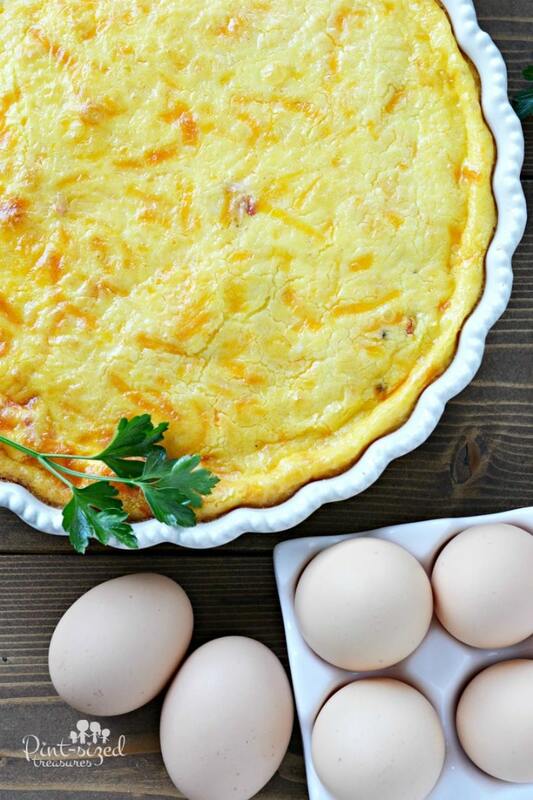 Ready for a low-carb, quick and easy, cheesy breakfast dish that will make your family smile? Mix eggs, whipping cream, salt and pepper together in one bowl and set aside. In large skillet, heat 2 Tablespoons butter and saute the onion and plum tomatoes until tender. place onions, tomatoes, bacon and half of the Parmesan and cheddar cheese in a bowl and stir thoroughly. Pourd this mixture to a greased pie or quiche baking pan. Then, pour egg and cream mixture on top. Gently pour egg and cream mixture on top. Then, top with remaining cheese and bake for 35 minutes or until quiche is set.